Running of the Bulls | Uncommon Mariners – Welcome to the World of Mariners, Pirates, and the Eternal Sea! This week Key West is celebrating Ernest Hemingway’s birthday. It’s a raucous and happy occasion with lots of shenanigans. There’s a contest to see who can parody his writing style the worst. A fishing tournament. An arm wrestling championship. A look-alike Hemingway contest with so many great Hemingway look-alikes that you‘ll question just how many Margaritas you downed. And my favorite… the running of the bulls outside Sloppy Joe’s Bar where Hemingway often drank. If you’ve never been to Key West for Hemingway Days, put it on your bucket list. Unless you’re an old grump. Then stay away because you’ll be miserable and only annoy the hell out of everyone else. 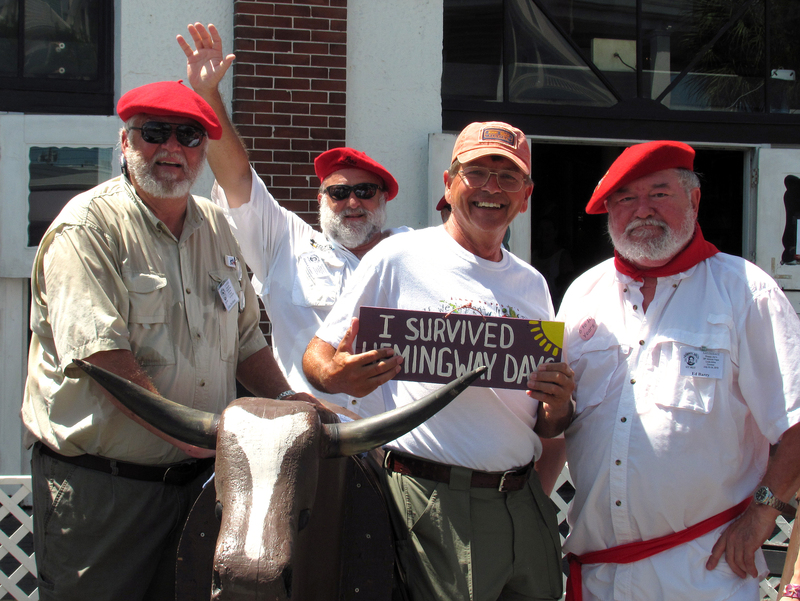 Two other seemingly unrelated events occurred this past week in a little town almost a thousand miles away, events that are key to appreciating Hemingway‘s past. In Washington, D.C., on July 24, a Senate Committee approved easing restrictions for commerce and travelers to Cuba; and for the first time in fifty-five years, Cuba opened its embassy on Monday, July 20; the United States did the same in Havana. But when Ernest first came to Key West, the truth is he knew little of the sea or fishing. That would soon change. One afternoon out on the Gulf Stream he was so impressed with the boat that he ordered an identical one with a few minor changes. When it was delivered, he named it the Pilar. From 1928 to 1940, he learned the art of fishing from two people: Sloppy Joe Russell and Carlos Gutierrez. Sloppy Joe was his fishing partner and owner of the bar where Hemingway drank when done writing for the day. Carlos Gutierrez worked as his first mate for years on the Pilar. The two men turned Hemingway into a maritime stud though he might grow angry were you to suggest such a thing.